his is a 1 cell lithium battery designed to work in E-Mon D-Mon Class 1000 KWH meters, Class 3000 KWH demand meters, Class 5000 advanced KWH demand meters, Green Class meters, Green Class KWH demand meters, Green Class Net meters, IDR-8 interval data recorders, IDR-16 interval data recorders. Low self discharge rate gives this cell a 10 year shelf life. Stable voltage and broad temperature range (-40� to +95�C). 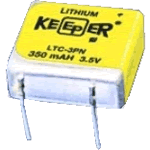 High energy, high reliability 3.5 volt power source is an excellent choice for memory backup applications. Dimensions: 0.65" x 0.60" x 0.27"
E-Mon D-Mon Class 1000 KWH meters, Class 3000 KWH demand meters, Class 5000 advanced KWH demand meters, Green Class meters, Green Class KWH demand meters, Green Class Net meters, IDR-8 interval data recorders, IDR-16 interval data recorders.